The heatsink pins consist of an inner pin and an outer pin, the inner pin is what makes the connection strong. Pull the inner pin out. You can grab it with a fingernail or some pliers. 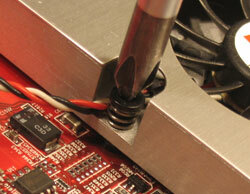 When using tools, be careful not to slip and damage the PCB. Once the inner pin is removed, turn the card around and push down the outer pin with your thumb. Do not use tools, since it is very easy here to slip and scratch the PCB. If you can't do it with your thumb, use a big flat surface (coin) to press on the pin. 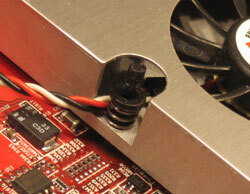 For additional safety put a paper towel between coin and video card. 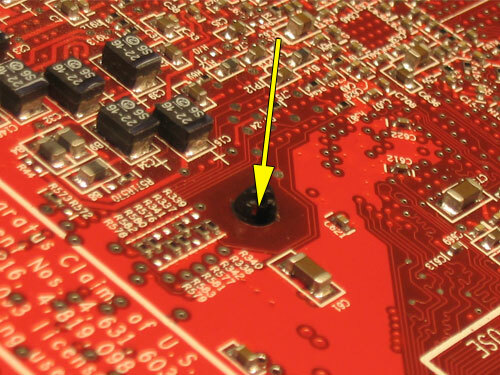 Align the pins with the holes in the PCB and gently press down the cooler, just enough that the pins go through the PCB a little bit. Now use a screwdriver or a ballpen (since it fits the hole it can't slip) to press down the pin, so that it safely goes through the video card. This step should not require much force. Look at the different spring compression between picture 2 and 3. Now put the inner pin back in, use your finger to press it down till it rests firmly. Again, if you have to use tools here put a paper towel on the video card, just in case you slip.